When Candy Hearts released EP The Best Ways To Disappear back in 2012 it seemed like they were on the verge of becoming the genres next ‘big’ band, and over the past two years they’ve generally kept that notion alive. When the band released I Miss You, the lead single from their newest record a few months ago it sounded like a step backwards, lacking a lot of what made that EP so great. Sadly, that’s the case with a lot of their sophomore album All The Ways You Let Me Down – a title that’s unfortunately fitting. I Miss You kicks things off here, and it still falls flat, seeing the record open with its weakest track, with things improving from here onwards. For the ten following songs that make up All The Ways You Let Me Down Candy Hearts play charming and catchy music in the same way that they always have, and although the album glows it does so with a glow which is dimmer than past works. As always the trios sound is one that guarantees a good time; it’s tough not to enjoy the sugary sweet guitars of The Dreams Not Dead or the chorus of the title track, but it becomes tougher to enjoy with each listen. All The Ways You Let Me Down plays it safe, and it’s all very familiar, becoming moreso with each song – seeing as the majority are very similar. Although as contagious as ever, Candy Hearts seem to have lost their staying power here, and very few songs make an impact in the way that say, Miles And Interstates did. For a summer soundtrack pop-rock record it delivers a lot of good ideas, but the right execution isn’t always there. Vocalist and guitarist Mariel Loveland is both the records biggest asset and its biggest liability. Her vocals are very good, atypical of the genre in that she sounds disinterested in an interesting way, often cruising along, with her delivery sticking to a certain plateau and rarely perking up. For some reason it works (although it loses its appeal as tracks pass), and she makes songs like the vibrant Michigan. Although she’s in her mid-20’s a lot of her lyrics read like they were plucked from the diary of a 14-year-old – take the chorus of I Miss You, which features lines including ‘I miss you when you haven’t even left yet’ and ‘forever doesn’t seem so awful with you, I wanna spend forever hanging out with you’. It’s a painful trend that runs throughout the record, clichéd and shallow, and it’s hard to take seriously as a listener. There’s a lack of depth, lyrically and musically, and although the records carefree, sweet nature will be one of its main draws it’s not fleshed out enough to really enjoy until the final few tracks. All The Ways You Let Me Down is meant for sunny days with friends, and it’s not really suited to anything else. It lacks the energy of past releases, and to be honest, it’s actually quite boring once it’s been played through a few times. Everything’s happy but nothing’s really amazing, to put a spin on the title of their debut. It’s upbeat and delightful, but after a few listens it starts to become tiresome very quickly. The Best Ways To Disappear is an EP I still listen to regularly, but after this review goes live I doubt I’ll be listening to All The Ways You Let Me Down again, which is a real shame considering how much I was looking forward to it. The second half of Candy Hearts’ second album is much better than the first, but not enough so to really save all of it. Fool’s Gold and Brooklyn Bridge are both dynamic and catchy, bouncing along, and each also sees Loveland push her vocals a little further, something she doesn’t do enough. Longer track Playing With Fire is another highlight, a personal song which opts for a slower sort of style as Loveland sings ‘give me a reason why every side of the bed feels like the wrong one in the morning / Tell me that happiness was sent to the wrong address / If we wait a while it’s still coming to me.’ It’s a different style to the bands norm, an almost-ballad, but it stands out as a result, as does Something’s Missing, which features Jordan Pundik of New Found Glory on guest vocals. Similarly to Playing With Fire it’s calmer, delicate in a sense, with a chorus that doesn’t particularly sound like a chorus, blending with the verses, as is also the case on The One To Get Me Out. Candy Hearts aren’t always explosive enough to distinguish clearly between the two, with tracks comfortable enough to get from A to B without too many changes in direction. As was the case with The Best Way To Disappear Chad Gilbert (also of New Found Glory) takes charge of production duties, and unlike on their EP his production is noticeably subpar. Guitars often get lost in the mix, with drums taking priority, and Loveland’s vocals don’t really shine in the way they should. There are snippets of spoken word on The One To Get Me Out but I didn’t notice it until my third or fourth listen, and as a whole the record doesn’t really have a ‘kick’ to it – even in its more upbeat moments. The songs are catchy, and the album is rife with hooks, but very few of them really sink in, missed opportunities. Instrumentally All The Ways You Let Me Down is solid, although it lacks energy for the most part, punchy but not quite powerful. 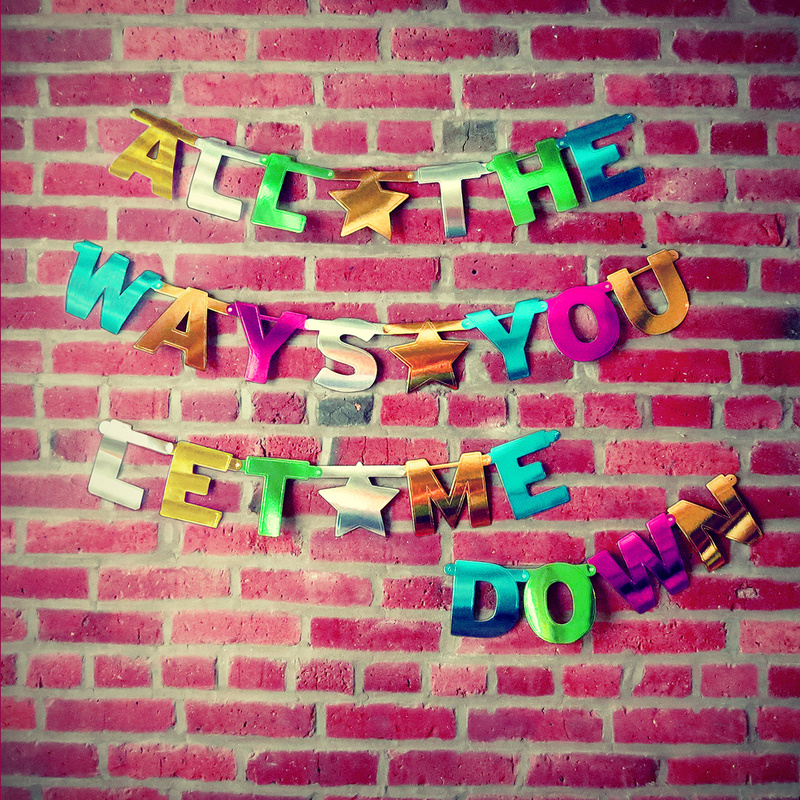 All The Ways You Let Me Down is undoubtedly a good time, but that’s about it. For most fans of the band that’s probably more than enough to merit a purchase, but personally speaking I wanted more. It sounds like a regression and I can’t shake it, even when the record makes me want to move. It’s far from a bad album, and initially it’s actually quite good, but in terms of longevity it doesn’t cut it. If you want a summer soundtrack Candy Hearts can deliver it, but only if used sparingly. Couldn’t agree more. Spot on. Thanks, seems like a few people were disappointed by this album.